Detective Comics featured DC's first masked adventurer and went on to give the company its name (from Detective Comics Inc.) and the only character to dominate American popular culture three separate times, each a generation apart: Batman. 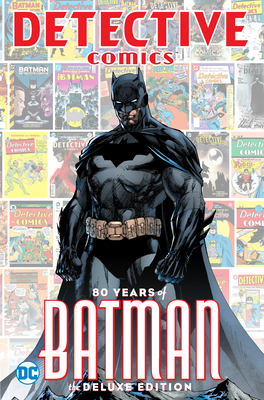 Join us in a celebration of Detective Comics' amazing eight-decade run and Batman's 80 years, with reflections on Detective Comics by Cory Doctorow, Neil Gaiman, Glen David Gold, Senator Patrick Leahy, Denny O'Neil, Anthony Tollin, police chief Shelley Zimmerman and Paul Levitz. This special collector's edition also features the very first Batman story; the debuts of classic sidekicks and allies like Robin, Batgirl, Batwoman and even Bat-Mite; and the first stories of archvillains Two-Face, the Riddler and Man-Bat. With a new cover by DC publisher and chief creative officer Jim Lee, a never-before-published sketchbook of Lew Sayre Schwartz, a never-before-published scene from Bruce Wayne's childhood by Paul Levitz and Denys Cowan and much, much more, this is sure to be the celebration of the year!